“Picture a world where instead of every car is a horse and wagon; every truck is a bigger wagon with a double team.. where the train blows its whistle once a day and you know it has your new Franklin stove on it.. where your neighbor and best friend brings her daughters to sew in the afternoon… while your boys play in the pond after their chores are done. There were wild tales of heroes and Cowboys & Indians, and stories of prospectors making and losing fortunes out west. Scandalous songs and dances were arriving every day with the circus performers, hobos and salesmen on the train. “I have often wondered what the difference between Archaeology and Anthropology is; the first being the study of all mankind as he changes – the latter selecting one very specific group of people in one specific time and place. “The War between the States was recent enough most adults could remember some connection. Industry was right on the verge (though not quite yet) of a boom- new products and conveniences were being developed and made available to the common man at an amazing rate, and at prices they could afford due to mass production. This was the time “sweat shops” were attracting young girls to the city where they thought they could be independent of what the youth of the day felt was the drudgery of farm life; where they would work in sewing factories or become typists which were two jobs still considered moral for young women. Indoor plumbing was available to the wealthy in cities, but the farmer still didn’t trust it, and used his “necessary” (outhouse) and chamber pot. No one had a drain in their sink. It hadn’t yet been invented. Many people embraced changes such as switching to the new forced air heating systems or the cleaner oil lamps, but others continued to burn kerosene and often following, their houses down. By the end of the decade, Thomas Edison had invented electricity, and a French inventor had figured out a way to boost and reduce charges so electricity could be used by regular people. Mr. Edison started work in new York to build the first hydro-electric dam. The first international telegraph connection to Brazil was accomplished in this timeframe. On the social front, people were starting to realize the pros and cons of a new industrial age. There seemed to be a split between a romantic desire to go back to the “good old days” (meaning Colonial in this case) with “Grandmother’s Garden” with love of similar art and Italian romance novels – vs – a drive for the future techno-age. Young people of the day were loving the new concept of having a party at a place other than home (the hotel in this case), and having leisure time after work. Girls were allowed to swim and play some sports and games, and the costumes for golf, croquet, tennis, and bicycling were starting to change the fashion world. People with opinions in between the “Grandma romance” and “New Techno Age” idea such as Upton Sinclair in “The Jungle” were starting to express disparity between “haves” and “have nots”. It was at this time lawas were made regarding monopolies because of the actions of railroad and financiers. “Overall the 1880’s were an era of abundance for most, especially those who knew how to work within the economy – whether farm or city. People had some time and extra money to splurge on things like Grange parties, the County Fair, and new hats; although the woman of the farm home never really had leisure time. It was an age where everything had a place and purpose, and everyone had a defined role. The exception to that was in household furnishings and fashion. In retrospect, we call this the “Victorian Era”, but the people of the time would have no concept of this being so far removed from the actual Queen Victoria of England whom they had left behind who was alive and setting fashion trends. Women, as they seem to have been through history, were caught in the desire to have the latest and most fashionable – in this case – the finest hats with feathers and ribbons – and the beautifully ornamented and totally functional less dresses with corsets, bustles, and paniers. We docents had 2 dresses for the summer. 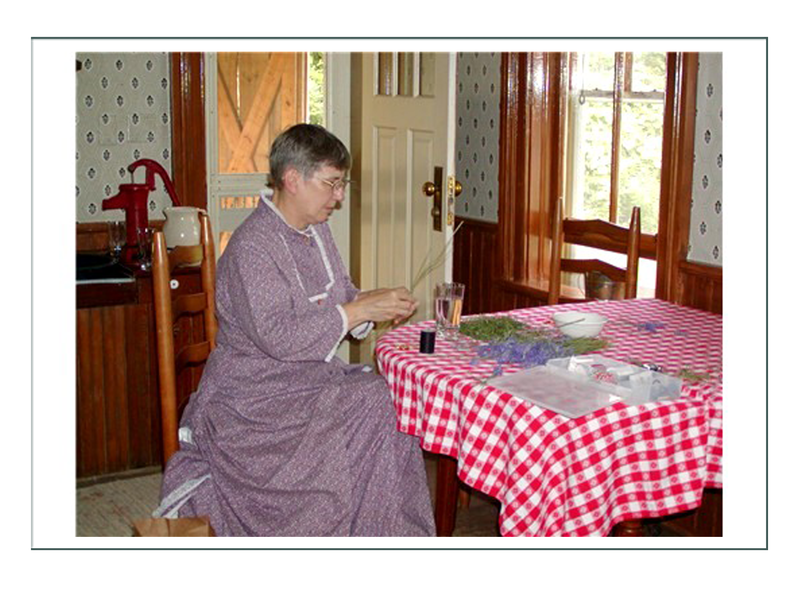 Having light colored fabric as we did would have been a luxury for real women of the era, because as we demonstrated, we quickly “trashed” both dresses working in the barn and fields. Every woman wore these same styles, including girls, who would wear a shorter version until the age of 10 when they took on “women’s work” and dropped their hems to the floor. 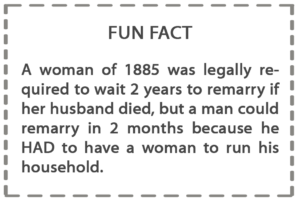 Women would have worn 3 petticoats. The more petticoats; the better. They insulated from cold and heat, protected from scratches of burrs in the field, and protected skin from sunlight. The apron had specific function; historians are still divided as to whether the newly invented safety pin would have been used, or the traditional straight pin that had been used since the Revolutionary War in America. Bustles, worn for dress up occasions and not daily work, had no function at all, and even dictated the design of furniture. It was in this era the “fainting couch” was designed so a woman who couldn’t bend in her corset could sit gracefully and church pews were designed with a slot along the bottom of the back support so the bustle could stick out. “We had no head nor air conditioning. We cooked on a woodburning vintage Franklin stove, and had to maintain and service all vintage equipment in the authentic way; e.g. “blacken the stove”. Bosses were sticklers to every etail including no soap used on cast iron pots, which meant using a corn cob at the pump to clean scrambled eggs off the pan – my specialty was delegating this task to the kids. We did cheat in putting bleach in the rinse water because of state health inspection rules since we ate everything we cooked. We pumped and carried water, laundered using “bluing” and a 12 hour process, and did dishes in a dry sink since drains hadn’t been invented yet. We would have used the outhouse, but our was (thankfully) an historic artifact they wanted to preserve. There were wasps in it anyway. Fortunately, most tools were as we know them now – metal hoes an drakes for mucking the barn or weeding the garden, plus a modern ‘carpet sweeper’. My favorite job, other than picking flowers to eat for lunch in our salad, was harvesting – anything – and most notably potatoes. We had a 3-crop rotation, used no chemicals, & the 1/3 acre (only a small representation of the acres they would have had) at the hands of volunteers produced abundant food. You will notice I use the term “we” referencing work quite often. “We” means “the women”. 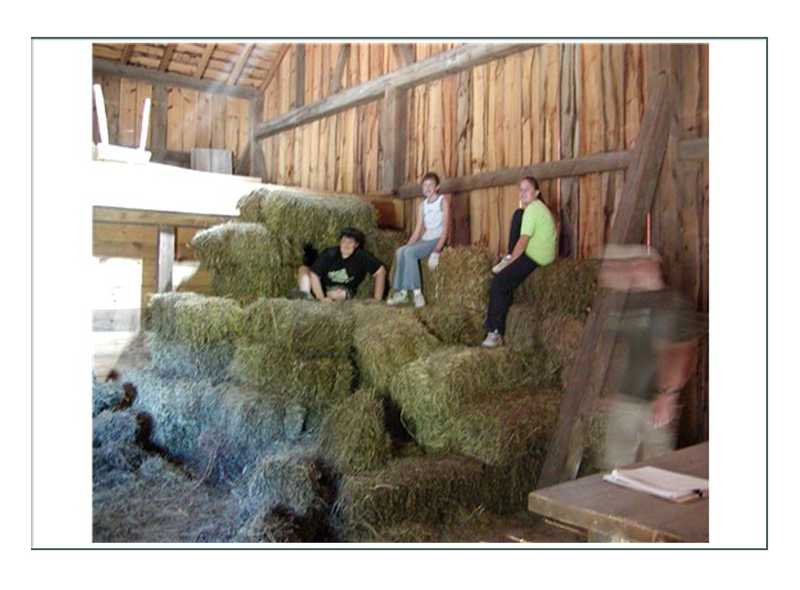 Every job on an 1880’s farm, and even in modern use of staff and volunteers, is done by WOMEN. Yes, men worked too, but they did specific tasks designated to them. Men did nothing in the house or the household, and absolutely no child or elder care. The house is clearly the domain of the women. Even in modern times, when men were called to dinner (lunch), they hesitated in the doorway and waited humbly for an invitation with their hat in hand. 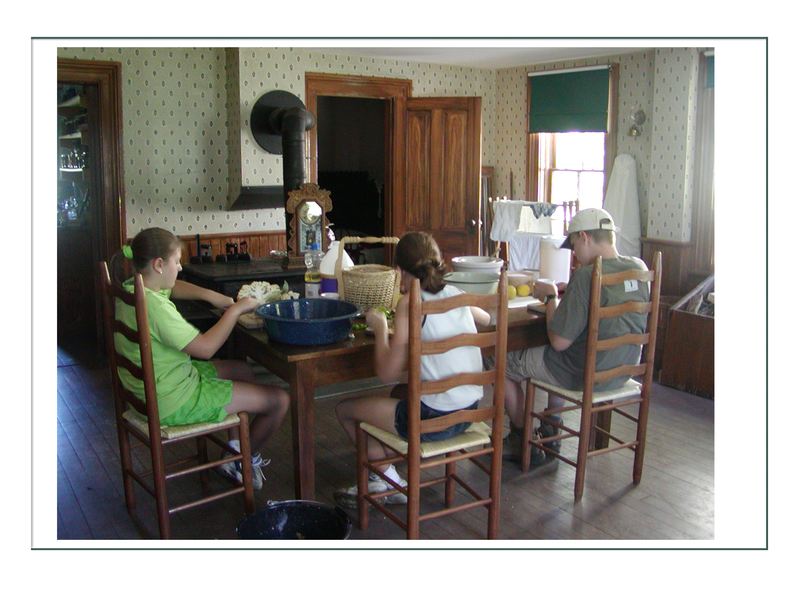 In the daycamps, we were historically accurate in the assignation of work – up until age 10, all children did everything. From age 10, boys started milking, plowing, and outdoor or barn work. The girls did too, but after those chores the boys went fishing, while the girls headed to the house to help with child care, sewing, fancy work, cleaning, cooking, etc. 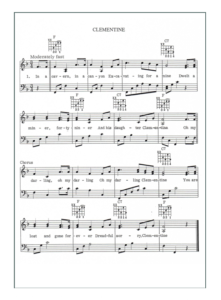 It was interesting that even in our modern era, I had a really hard time getting the boys to work after a certain amount of time – regardless of age – while the girls kept going cheerfully (I think they were glad to leave the boys). 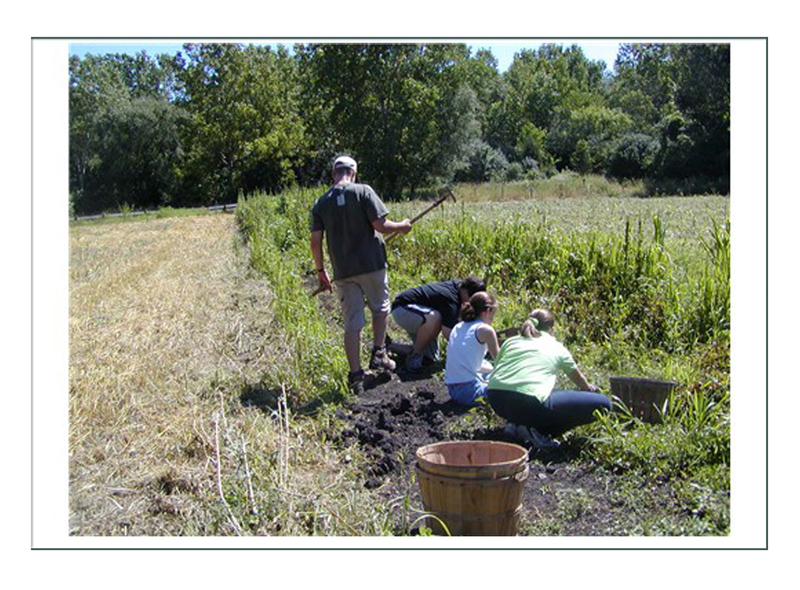 “The interpretation I was specifically assigned to teach was to young adults & teens who worked along side me as we learned about historic farming with hands on. 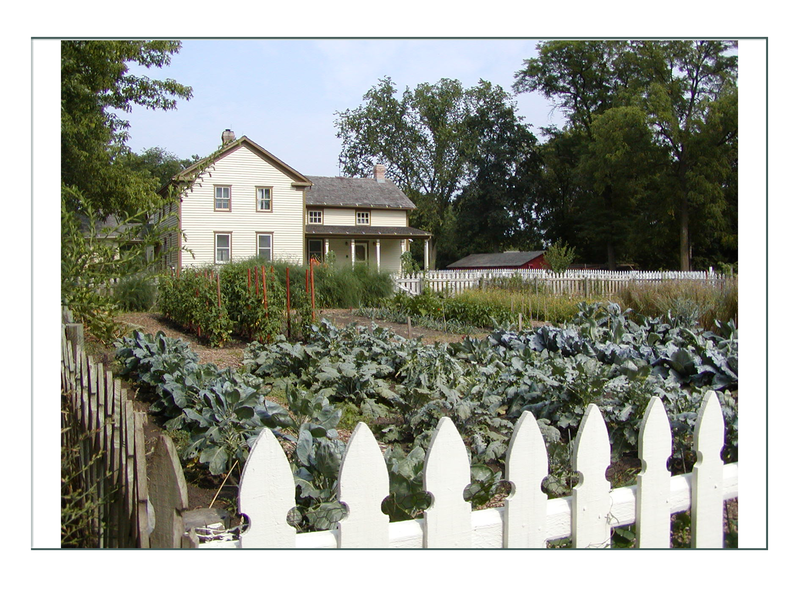 The Historic Foodways concept is the reason the living history farm exists; to link an earlier American past with the 1880’s and forward to agricultural society today. 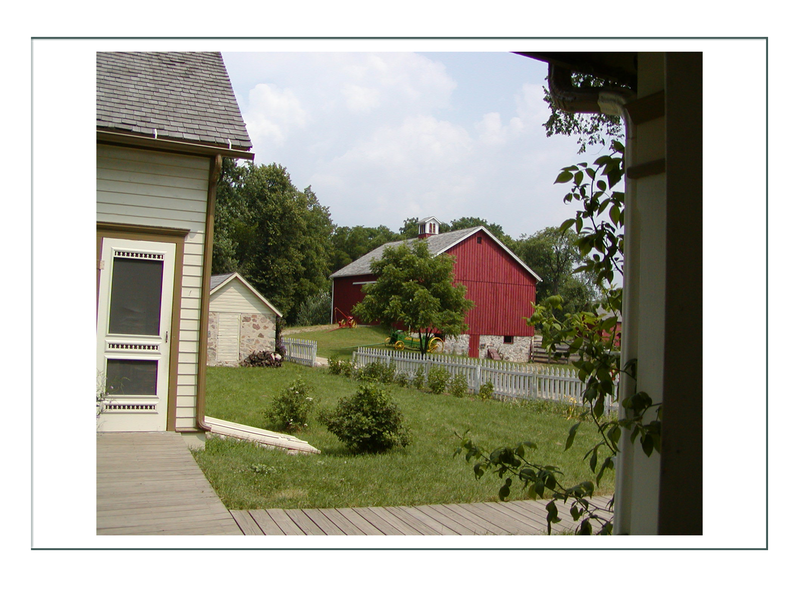 The farm is a representation of a German-American farm. Families came to the area in 1860 from Germany when the feudal system broke down there, leaving many farmers homeless and landless. Spurred by beautiful letters from relatives, and heavy print marketing that described the American Midwest as a land of plenty, the people came to this, the last of the regions to be settled in the US. These Germans bought land from “Yankees” who had given up. “Yankees” were American Easterners who moved west seeking fortunes, under the mistaken assumption that the most fertile land was where the trees grow. The Germans knew how to get high yields from small plots. 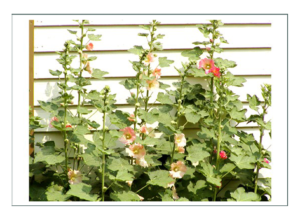 They recognized potential in the deep prairie soils. Having experience with the new steel (John Deere) plows, they were able to get 3 crops out of one season by using crop rotation. The dairy farm was unique from other farms of the era, because it was not only self-sustaining, but could produce a surplus. This surplus, used for profit or reinvestment, was the key to the historic foodways process. The German-American family could maintain dairy cows very cheaply on grains grown on their own farm at a time the rest of American farms were being run by bigger and bigger conglomerates utilizing more land to create larger yields. 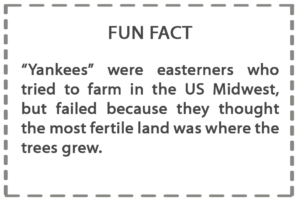 The German farmer was able to produce the same volume of produce on his small farm as the big ones. The secret was manure. Manure fertilized the kitchen garden. The garden, the size of today’s football field, could feed a family of six through crop rotation practicies and deep soil fertilization. The labor force in the garden was children, and they had a lot of them. The potato field was a key as well, and it was cultivated and maintained using manure. The farm always had orchards with apples, pears, plums and exotics (citrus came on the train). 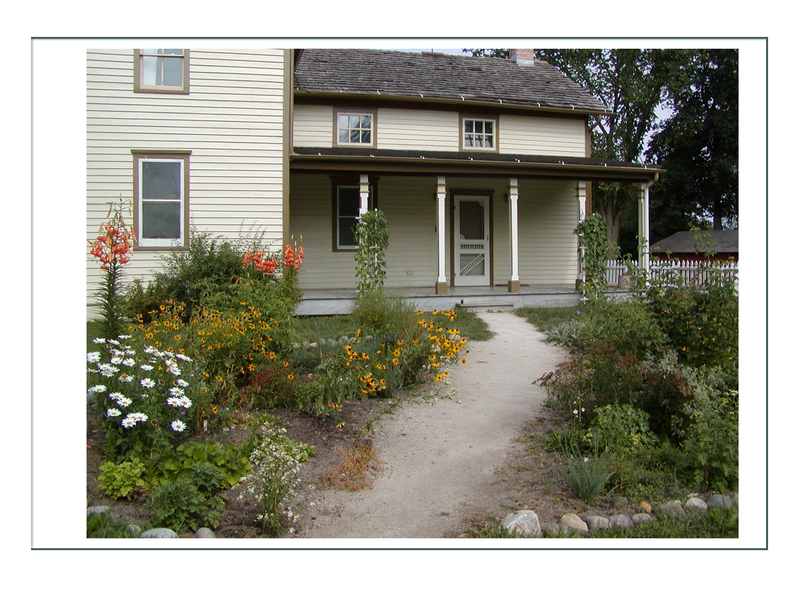 The family kept bees, with a ready source of prairie flowers nearby. Hay, corn, oats, alfalfa, and wheat were grown in quantities to feed livestock and no more. The family bought grain from the nearby mill, so they rarely grew for themselves. Grain fields were small by today’s standards, but yield was relatively much greater. Power was horse-drawn with easily available and efficient steel implements. 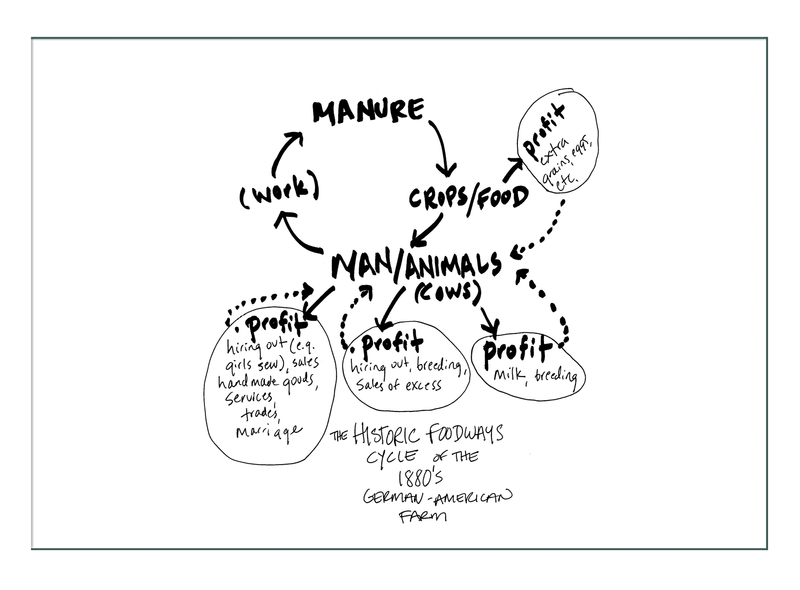 “The Historic Foodways cycle is this: man or animals yield work, pus a byproduct of manure. 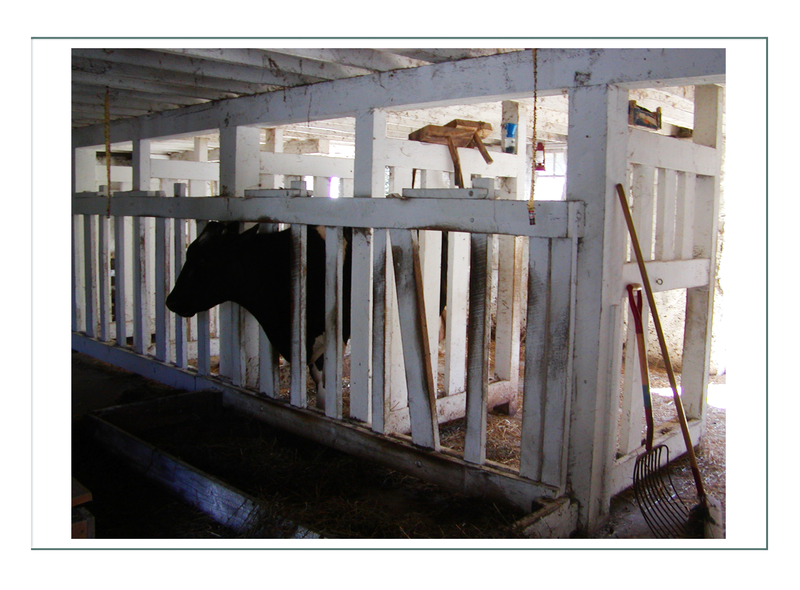 Manure, composted with kitchen & barn refuse (straw & hay), is applied to crops to grow abundant food to feed the man or animal so he can work and generate – more manure. 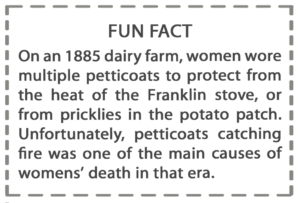 The German-American farm had the added benefit of surplus milk products, eggs, and some animal products to use in purchase of other items to eat, or assist in work or better production – which then yielded more – manure (and by-products, etc.) 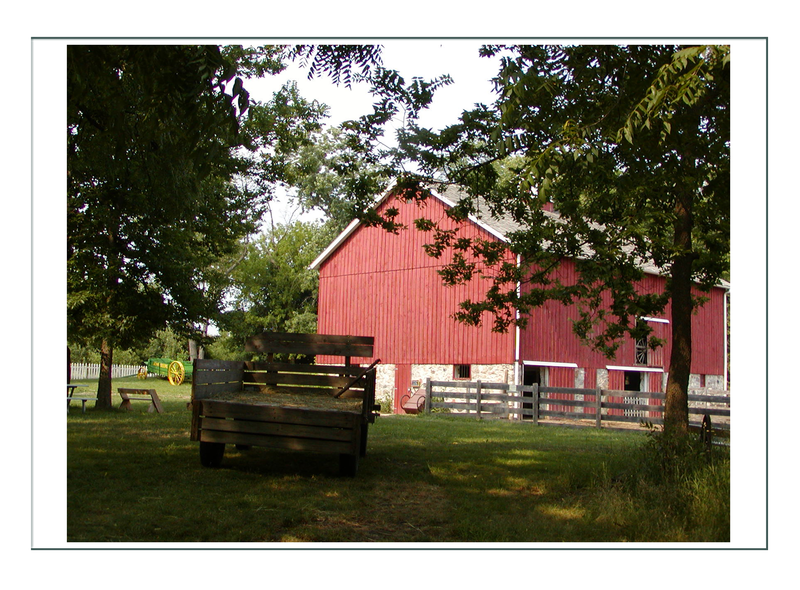 The farm itself was efficiently designed to support the cycle. The chicken coops was near the house so the wife could maintain it, the barn was near the house but further away so the farmer could get there easily in all weather. The compost/manure heap was located at exactly the same distance between house and barn for ease in transport and smell reduction. 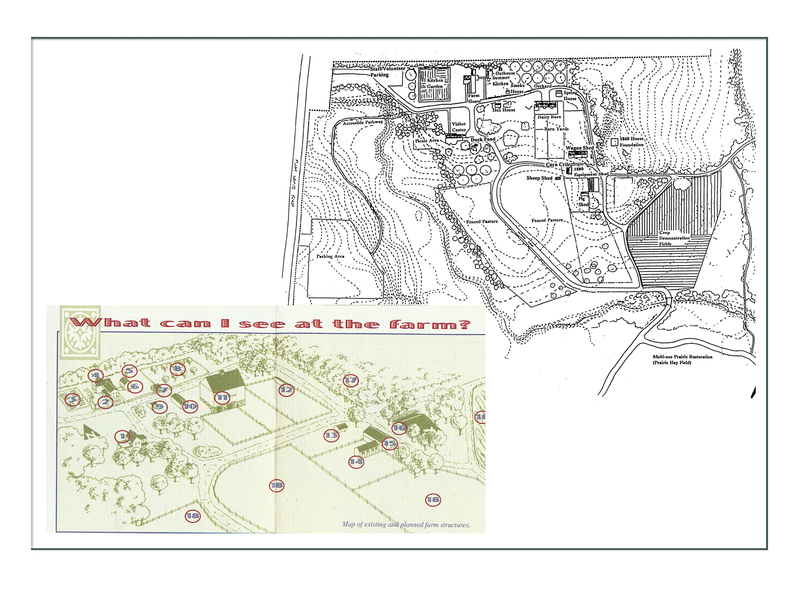 Animals were fenced in with a pattern for rotation between pens to maintain grasses for grazing. Fields were outside of everything on the original prairie. The smokehouse was near house & barn, but not too close. Fire was a real and always present danger, as fire departments did not go to rural areas. For this reason, there was a summer kitchen set away from the house. It was not only a ocoler place t cook, but also provided food storage and a place to dry out produce. “Everything had a plan and a purpose. Everyone had jobs and knew them well. Roles were well defined for family members, and the rules very clear. 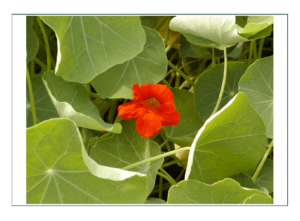 It was a time of growing abundance in a world that was also growing by leaps and bounds. The 1880’s German-American farmer worked very hard, and enjoyed the benefits of profit. He had goods and services available nearby, and money to pay because of his proximity to growing urban areas, yet he was still isolated enough to enjoy his type of cultural and agricultural practices. 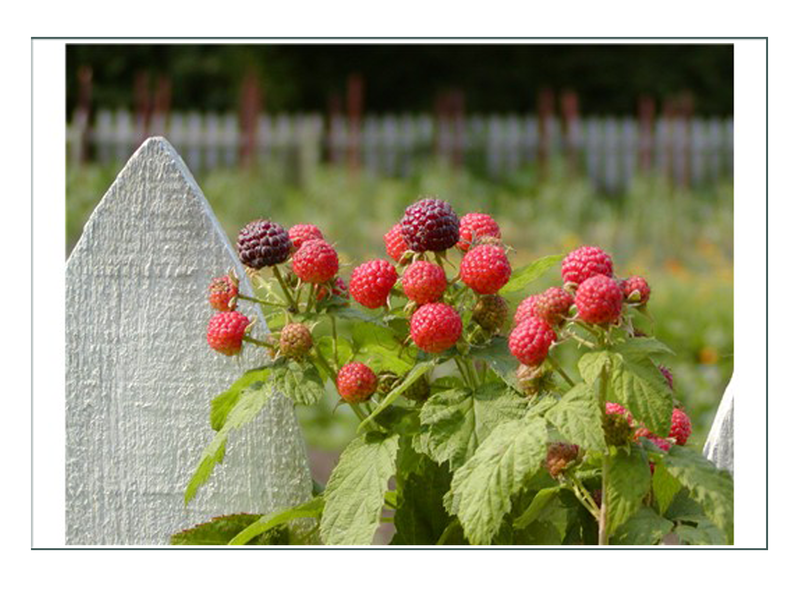 The Historic Foodways cycle no longer exists because farmers no longer attempt to be self-sustaining. Farms today specialize in products for sale and export, and do not generate the by-products needed to recycle. 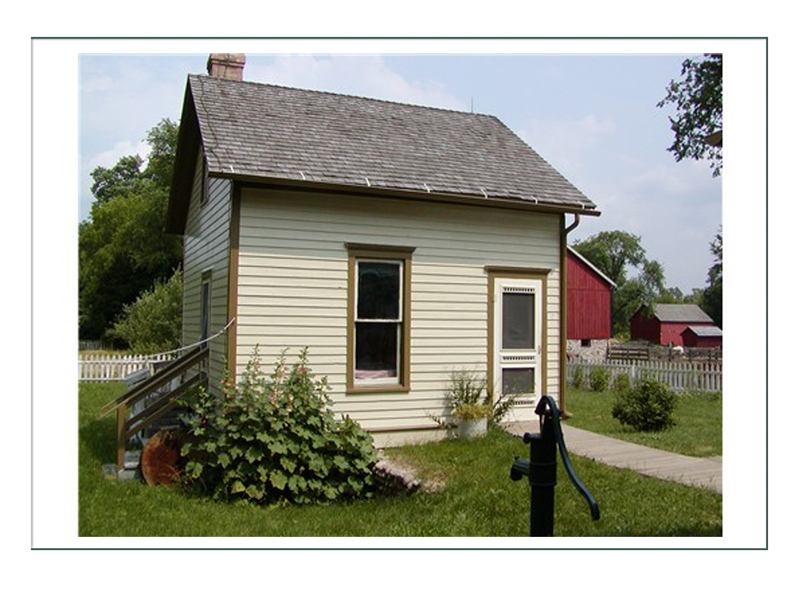 This heritage farm depicts an age of hope and new beginnings, yet with the comforts of a well-loved heritage and those that come through profit. 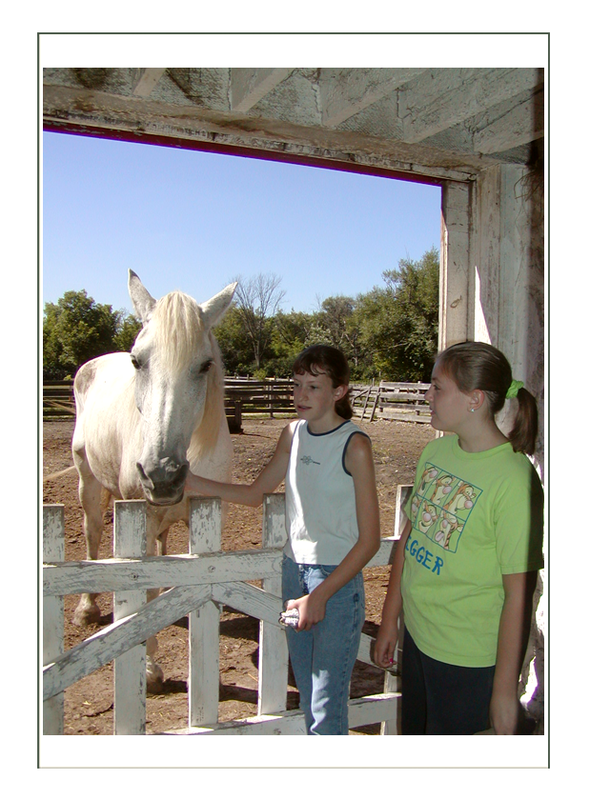 The next generation would be enticed to leave the farm – the girls to seek independence working for themselves in the cities, and the boys to try their hands at industry or finance. Historians would see the decline of the self-sustaining family farm soon after this period, but for a brief time in history, a small group of people lived happily with a bright future and lots of .. manure.